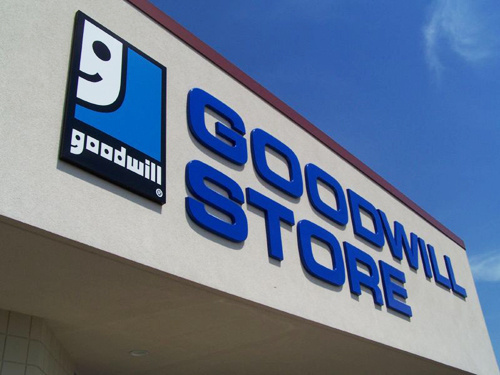 I read a lot about how you all visit Goodwill and get great deals! I wanted in on the action! Yesterday on my way home from work I stopped at the Goodwill near my town and went hunting! Once I walked in I spotted the Target items instantly! Almost all of the Halloween decorations I had been eyeing last year were there! I was shocked - and grabbed a shopping cart instantly to load up! I did some research last night and found that some Goodwill's will buy "salvage" (things they've deemed unworthy to be on the shelf due to damaged box, open box, etc.) from Target or other stores. Cha-ching! -A set of 10 pumpkin buckets to be used in a ball toss game for $1.99! -25 marble notebooks (speech books, of course!) at $0.74 each! -Yarn for my "old lady" that's in the works! -Halloween placemats to be used as decorations for $0.99! I'm in awe! I can't wait to go back! What have your Goodwill experiences been? ?